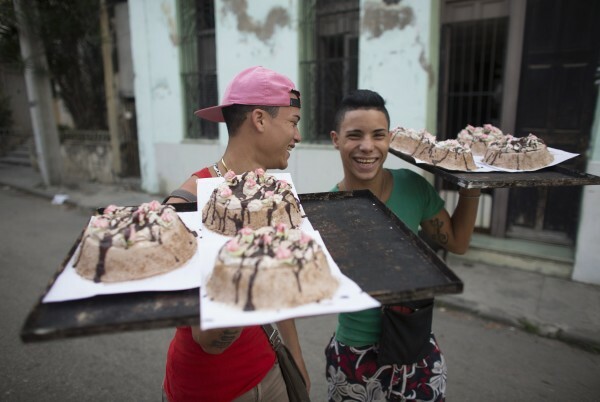 Emanuel Gonzales, 19, (left) and Emanuel Perez, 17, (right) carry home-baked cakes for sale on the streets of downtown Havana Jan. 9. Despite more than five decades of hostility between Washington and Havana, and Cuba's Cold War alliance with the Soviet bloc of communist countries, many Cubans admire U.S. culture even if they oppose its politics and the long trade embargo against their country. Following President Barack Obama's historic shift in Cuba policy last month, the two governments meet on Wednesday and Thursday to set about restoring diplomatic relations. Pope Francis, Obama, and Castro — no, that’s not the beginning of a joke. Pope Francis has again used his moral authority as head of the world’s largest Christian denomination, this time to bring together Raul Castro and Barack Obama, helping to open diplomatic relations between Cuba and the United States for the first time in more than 55 years. The agreement between Obama and Castro included an exchange of prisoners, the release of some political prisoners in Cuba, and an easing of some travel and commercial restrictions. This easing of tensions between our two nations is long overdue. The Cuban Revolution of 1959 was received positively at first by many Americans. But as Cuba nationalized businesses, executed political opponents, and drew close to the Soviet Union, the United States responded by initiating the failed Bay of Pigs invasion and CIA attempts to assassinate Fidel Castro. Then, to protect themselves from a powerful and aggressive neighbor, Cuba began installing Soviet missiles. The 1962 Cuban Missile Crisis followed, bringing the world to the brink of nuclear War. After a brief U.S. naval blockade of Cuba, President Kennedy and Chairman Khrushchev negotiated and averted war. But the United States has continued an embargo on trade and travel with Cuba for more than five decades. Now, as President Obama told Congress, “When what you’re doing doesn’t work for 50 years, it’s time to try something new.” Ordinary Cubans suffer from the embargo, but it hasn’t succeeded in changing the Cuban government’s economic or human rights policies. We don’t know yet whether the new U.S. policy shift will lead to more political and economic freedom for ordinary Cubans. But we do know that trying to isolate Cuba has not worked. A joint statement from the National Council of Churches in the U.S. and the Cuban Council of Churches has asked the U.S. Congress to lift the travel and trade embargo and remove Cuba from the U.S. list of countries that support terrorism. Just as we should lift the embargo, Cuba should release all political prisoners and adhere to the Universal Declaration of Human Rights (which Cuba has formally accepted but not implemented), and implement constitutional reforms leading to free and contested elections. Protestant and Roman Catholic churches, and other religious groups in the United States, have long worked to maintain relations with religious organizations in Cuba. Despite travel restrictions, delegations from the United States have found ways to visit and remain in fellowship with Cuban Christians and other religious and non-religious Cubans. I hope that these kinds of exchanges will accelerate now that Pope Francis has brought the political leaders of the U.S. and Cuba into political dialogue. It is long past time for us to end more than five decades of failed policy. While we cannot know what the future will bring, it appears that giving Cubans and Americans the opportunity to interact with one another through trade and travel offers a better chance for expanding political and religious freedom for Cuba and its people. The Rev. J. Mark Worth has served churches in Maine and Massachusetts since 1991. He is currently the interim minister of the Unitarian Universalist Church of Westborough, Massachusetts, and lives in Penobscot, Maine, and Shrewsbury, Massachusetts.